Hi everyone! So, how is your 2018 going so far? Sticking to those New Year’s resolutions? I usually take the “Easy On Myself” route when it comes to resolutions. Don’t get me wrong, I do make them. I don’t necessarily start them on January 1st. And I don’t make them super specific. So, this year I decided my resolution was just to Take Better Care of Myself. General enough? Of course, that means eating better, exercising regularly and keeping up with my overall health maintenance. But, it also adds in doing what I love to do more than anything in the world and without any guilt. For some of you that may mean eating chocolate once in a while or sleeping in on Saturday morning…guilt free. For me, that means, what else…cooking and sharing my creations with others! Why would there be any guilt attached to that, you ask. My poor husband often asks when I am cooking or baking if the food is for him or somebody else or if it has to be photographed before he can eat it. Oh, the life of a Food Blogger’s spouse! So, doing what I love also means trying more to be mindful of new dishes my husband wants to try and getting the photos done in a timely manner. I mentioned before that my husband has been searching for flavorful recipes that are meatless. He came across this one in my stack of magazines. (You know, the ones that are supposed to be part of my cleaning resolution). 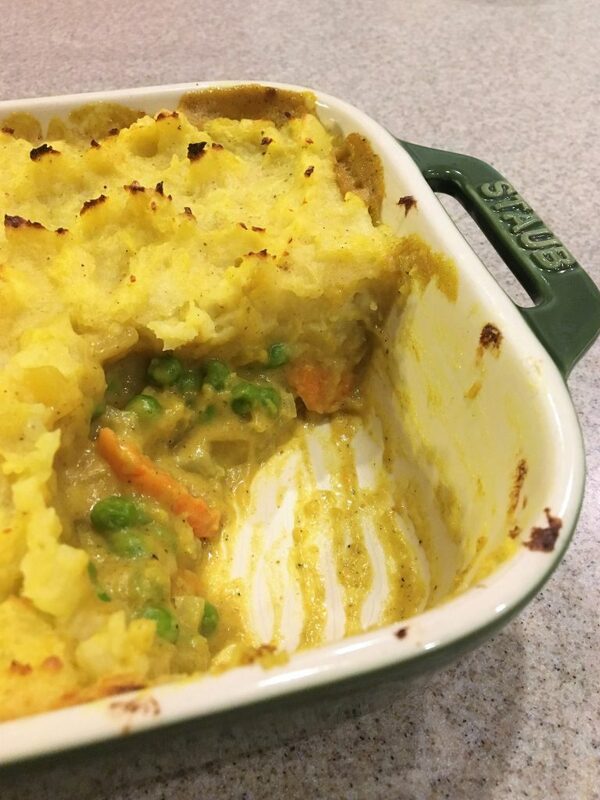 Anyway, it sounded awesome…Curried Vegetable Shepherds Pie. 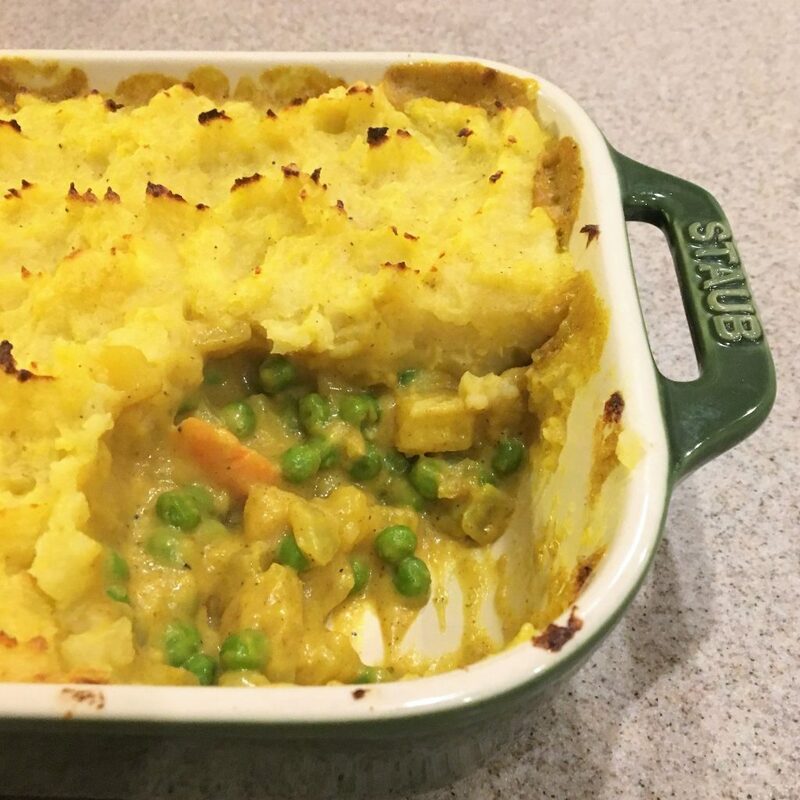 I make Shepherds Pie often since my husband is English, but I have never tried a Vegetable Shepherds Pie, let alone a Curried Vegetable Shepherds Pie. This recipe is actually the best of both worlds when it comes to English dishes. 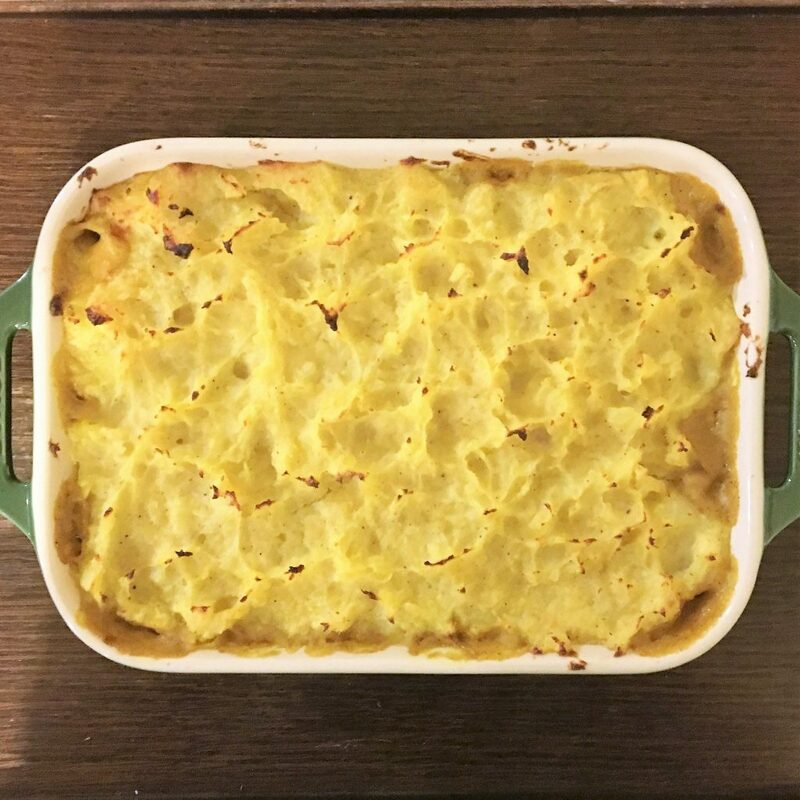 Shepherds Pie traditionally is made with a layer of meat and vegetables in a rich gravy, topped with a mashed potato layer and baked to a toasty brown. But, Curried Vegetable Shepherds Pie adds in the Indian influence that you often see in English dishes in the form of curries. What a great mash up! No pun intended. And completely vegetarian. Now if you want, you can add in some sauteed beef or lamb, but it really is a hearty dish all on its own. If you are trying to steer away from white foods like potatoes, you can also try substituting cauliflower or sweet potatoes. What I really like about this recipe though are all the yummy root vegetables in it. Turnips, rutabagas, leeks and carrots give a great depth of flavor to the filling. The creamy curried gravy is lightened up a little with Fat Free Half and Half, my go-to dairy product when it comes to cream sauces. Now, I know you hate it when you want to try a recipe and there are ingredients that you do not have on hand or seem like they may be hard to find. When I share my recipes with you, I try really hard to either give you substitutes for some of those ingredients or give you the source for you to easily find it. In my recipe for Curried Vegetable Shepherds Pie, there are a few, starting with the vegetable. Even though turnips and rutabagas may not be the vegetables you buy every day, they are pretty much available in most grocery stores. Even if you have never tried them, trust me, you will love them in this dish. Leeks are another one. You hear the horror stories about having to wash and soak them to get the dirt and grit out of them. Well…to the rescue are Organic Leeks that usually are cleaned and don’t cost much more than the regular ones and Trader Joe’s Trimmed Leeks. I still recommend washing them, but they are amazing. Finally, one ingredient I use that gives this dish incredible flavor is the mushroom bouillon that I buy online at Savory Spice Shops. It adds a richness to this dish that I just love. I use it in other soup and vegetable recipes too. You can substitute vegetable bouillon or broth that you find at your grocery store to make it easier, but this one is worth ordering online. You will love it! A final note on substitutions, if you want to give this dish a little bit of “meaty” flavor, you can use beef or chicken broth or bouillon cubes in place of the mushroom/vegetable ones. There you go. A great New Year’s recipe, vegetarian (if you like), presented to you in February (no pressure to do it all in January), that has become my husband’s favorite and I believe will become one of yours. Happy New Year’s Cooking from the Memorable Kitchen! Place potatoes in a medium saucepan. Cover with water and bring to a boil. Reduce heat to medium, cover and cook for 20-25 minutes until fork tender. Drain and let cool slightly. Peel and set aside. Place turnips, rutabaga, and carrots in a medium sauce pan. Cover with water and cook for 5-7 minutes until tender. Drain and return to sauce pan. In a small saucepan, melt 4 tablespoons butter over medium heat. Add leeks and cook for 10 minutes until tender. Stir in flour and cook for one minute to form a thick paste. Add 1 teaspoon salt, ½ teaspoon pepper, 1 tablespoon curry powder and thyme to mixture and cook for an additional minute. Whisk in vegetable broth and 1 cup of milk or half and half. Stir until thickened and smooth. Add in frozen peas. Cook 2-3 minutes until peas are tender. Pour sauce over cooked vegetables and stir until combined. Cook one minute more until heated through. Pour into a medium (3 quart) baking dish. To the potatoes, add remaining 4 tablespoons of butter, 1 teaspoon of salt, ½ teaspoon pepper, ½ teaspoon curry powder and ½ cup milk or half and half. Place over low heat and mash with a potato masher or whip on low speed with a hand mixer until combined. Do not over mix. Spread mashed potatoes over vegetable mixture in the baking pan. Using a spatula or wooden spoon, pat and lift up spoon to form peaks on the potatoes. Bake at 400 degrees for 20 minutes until bubbly. Place under broiler, if desired, for 1-2 minutes to brown.